Hangar "SPRINT M" is mounted in city of Magnitogorsk of all for two weeks. That not warmed variant of a hangar "Sprint M" having size 12X20м, is mounted in city of Magnitogorsk of all for two weeks. Such high speed of building became possible thanks to application by company of technology of fast erection of buildings from easy steel thin-walled designs. The marked elements of a design of a hangar ready to assemblage "Sprint M", in a full complete set and reliable packing have been delivered to a building site. 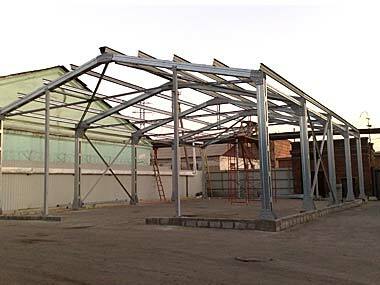 As a building material the zinced steel thin-walled thermo profile was applied to a metal skeleton of a hangar "Sprint M" with increased bearing ability PGS-SIGMA and ТПС. Loading of a building of a hangar on the base, calculated by designers of company "INSI-ENGINEERING" and specified in the building passport, has allowed being limited to dot concrete support under the basic vertical racks of a construction. On them, by means of a truck crane, during half of labour shift the frame design from thermo profile PGS-SIGMA from vertical racks and farms has been established. 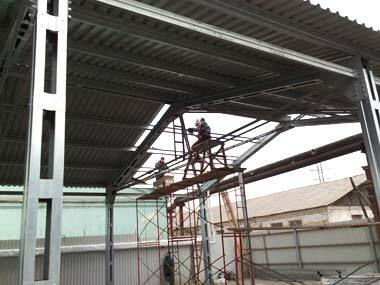 At installation стеновых the couplers providing rigidity of a skeleton, and runs for fastening of roofing covering thermo profile ТПС was applied. From a building end face additional racks for the equipment of gate have been mounted. Bolt connections of details in knots of fastening of elements of a skeleton were made by wrenches and nut setter. In quality wall protections have been used zinced profiled steel sheets with small height of profile С-18, protected from destructive influences of environment by a polymeric layer. Sheets wall profiled deck а have been made at once necessary length, and Meir installation passed without horizontal joints. Connections of lateral surfaces profiled sheets on building corners are closed by an angular lath. To a roof covering it was applied more rigid zinced profiled deck, having average height гофра, С-44. Me high profile allows to maintain to this type profiled sheets considerable snow loadings (Magnitogorsk is located in IV snow area), and the polymeric layer reliably protects from atmospheric influences. Sheets roofing profiled deckа, as well as стенового, have been made at once design length and mounted entirely, without horizontal lap. The top connections profiled sheets are covered коньковой by a lath. Fastening profiled sheets to elements of a skeleton of a hangar "Sprint M" was made zinced self-tapping screws with a lining protecting from leaking. Prefabricated hangars "Sprint M" are irreplaceable today as warehouses thanks to convenience and speed of installation. The conjuncture of the modern market demands fast reaction to demand, and it is impossible without presence of spacious warehouse. Very often there are situations when the place was necessary for production storage still "yesterday". 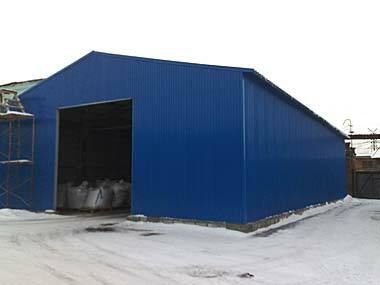 Erected in Magnitogorsk for few days the inexpensive hangar company "INSI-ENGINEERING" "Sprint M" quite has satisfied the customer with quality and, the main thing, speed of construction.